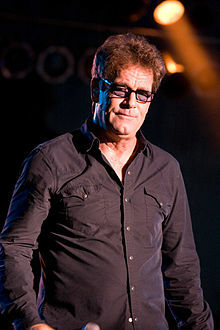 Huey Lewis was born in New York City. His father, Hugh Anthony Cregg Jr., was an Irish-American from Boston, Massachusetts, and his mother, Maria Magdalena Barcinski, was Polish, from Warsaw. Lewis was raised in Marin County, California, living in Tam Valley and Strawberry, and attending Strawberry Point Elementary School (where he skipped second grade) and Edna Maguire Junior High School in Mill Valley. When he was 13, his parents divorced. He attended and graduated from the Lawrenceville School, an all-male prep school in New Jersey, in 1967, and he achieved a perfect score of 800 on the math portion of the SAT. He was also an all-state baseball player. Lewis attended Cornell University in Ithaca, New York. His mother had an extramarital affair with Beat Generation poet Lew Welch who became his step father. Lewis' credits Welch with inspiring him in his early teenage years. In an interview with David Letterman, Lewis talked about hitchhiking across the country back to New York City and how he learned to play the harmonica while waiting for rides. He talked about hanging out at the airport for three days until he stowed away on a plane to Europe. In later interviews, Lewis would reveal other encounters he had traveling around Europe. While visiting Aberdeen, Scotland, with no money and nowhere to sleep, he claimed that the locals were very hospitable by offering him somewhere to stay. In Madrid, Spain, he became an accomplished blues player as he hitchhiked and supported himself by busking with his harmonica. He gave his first concerts in Madrid, earning enough money to buy a plane ticket back to the US. Upon his return, Lewis entered the engineering program at Cornell University. While there he made friends with Lance and Larry Hoppen who later played with Orleans and Eddie Tuleja of King Harvest. Initially an active student and a member of the fraternity Eta Lambda Nu, Lewis soon lost interest in college. He signed up with a band called Slippery Elm, and in December 1969 during his junior year, he dropped out of Cornell and moved back to the San Francisco Bay Area. His aim was to continue playing music, though along the way he also tried other fields of work including landscaping, carpentry, wedding, and event planning, as well as delivering and selling natural foods. In 1971 Lewis joined the Bay Area band Clover. Around this time he took the stage name "Hughie Louis", the spelling of which he would tinker with for some years after. Other members of the band (at various points) included John McFee, Alex Call. Lewis played harmonica and sang lead vocals on a few tunes. In 1976, after playing in the Bay Area with limited success, Clover went to Los Angeles. They had their big break in a club there when their act was caught by Nick Lowe who convinced Clover to travel to Great Britain with him. However, Clover arrived in Britain just as their folk-rock sound, known as pub rock in Britain, was being replaced by punk rock. The two Clover albums produced by Robert John "Mutt" Lange for Phonogram were not successful. By this point the spelling of Cregg's stage name had changed to "Huey Louis"; it is under this spelling that he is billed on both of Clover's albums for Phonogram, although for songwriting credits he is billed as "H. Cregg". In 1978 the band returned to California, McFee joined the Doobie Brothers, and Clover disbanded. Under the name "Bluesy Huey Lewis", Lewis played harmonica on Thin Lizzy's 1978 landmark album Live and Dangerous. That same year, he was playing at Uncle Charlie's, a club in Corte Madera, California, doing the "Monday Night Live" spot along with future members of the News. At this point, he had adopted the "Huey Lewis" spelling, and the band was billed as Huey Lewis and the American Express. After recording the song "Exodisco" (a disco version of the theme from the film Exodus) simply as American Express, Lewis landed a singles contract from Phonogram and Bob Brown became his manager. The band played a few gigs (including an opening for Van Morrison), before adding new guitarist Chris Hayes to the line-up. On Brown's advice, they changed their name again to Huey Lewis and The News. After a failed self-titled debut in 1980, the band finally broke through to Top 40 success with the gold album Picture This (1982). It rose to No. 13 on the albums chart thanks to the Mutt Lange-penned "Do You Believe in Love" (No. 7), the band's first hit. The band's third LP, Sports (1983), is one of the best-selling pop releases of all time. It became a No. 1 hit in 1984 and had multi-platinum success in 1985. Four singles from the album reached the top-10 of the Billboard Hot 100: "Heart and Soul" reached No. 8, while "I Want a New Drug," "The Heart of Rock & Roll," and "If This Is It" all reached No. 6. Lewis knew Nick Lowe and Dave Edmunds from having played harmonica on their 1979 albums ("Labour of Lust" and "Repeat When Necessary") and produced Lowe's 1985 version of "I Knew the Bride (When She Used to Rock and Roll)". He later produced several songs (including one where he sang backup and played harmonica) on Bruce Hornsby & The Range's debut album, The Way It Is. Hornsby thanked him by writing the song "Jacob's Ladder", a No. 1 single from the News' next album. His song "The Power of Love" was a No. 1 U.S. hit and was featured in the 1985 film Back to the Future, for which they also recorded the song, "Back in Time". Lewis has a cameo appearance in the film as a faculty member who rejects Marty McFly's band's audition for the school's "Battle of the Bands" contest. As an inside joke, the piece the band plays is an instrumental heavy metal version of "The Power of Love". (Lewis plays the audition committee leader, who, after glancing at the other, equally unimpressed fellow faculty members, picks up the megaphone and says, "Hold it, fellas ... I'm afraid you're just too darn loud".) A poster for the album Sports is hanging on Marty's wall when he awakes at the end of the movie. "The Power of Love" was nominated for an Academy Award. Following the success of "The Power of Love" and Back to the Future, Huey Lewis and the News released their fourth studio album, Fore! in 1986. Fore! followed the success of Sports and reached No. 1 on the Billboard 200. The album spawned the No. 1 singles, "Stuck with You" and "Jacob's Ladder" as well as the mainstream rock hit "Hip to Be Square". In all, the album had five top-10 singles on the Billboard Hot 100 and was certified triple platinum. Lewis and his bandmates performed on USA for Africa's 1985 fund-raising single "We Are the World". The remainder of the 1980s and early 1990s were mostly spent touring and recording fourteen top-20 Billboard Hot 100 hits and releasing two more hit albums: Small World (1988) No. 11 and Hard at Play (1991) No. 27. Lewis had a planned solo album titled Back in Blue that was canceled in the mid-90s due to living arrangement issues on the part of Lewis. One of the songs from that cancelled project, "100 Years From Now" was later used for the compilation album Time Flies... The Best Of. 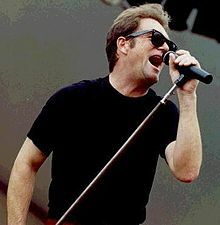 Huey Lewis has sung with Umphrey's McGee at several shows beginning with the 2005 Jammy Awards and is featured on two tracks of their album Safety in Numbers. On February 13, 2007, Lewis was interviewed on the podcast series Stuck in the '80s. During the interview, he revealed that the band has written several new songs that they planned to record in 2008. He also stated that, given how much the industry has changed since their last album, he was unsure how they would sell the new material. During a show at the California State Fair on August 21, 2007, Lewis was named Sacramento's Musician of the Year by the fair's general manager and presented with a gold statue of the California state bear. Lewis recorded a duet version of "Workin' for a Livin'" with Garth Brooks, which was included on Brooks' three-disc set The Ultimate Hits, in late 2007. On July 4, 2008, the eve of his 58th birthday, Huey Lewis and the News were the opening act for the annual A Capitol Fourth celebration on the west lawn of the U.S. Capitol in Washington, D.C. More than a half million people attended and was broadcast live on PBS. The band performed "The Heart of Rock & Roll", "The Power of Love" and "Workin' for a Livin'". On May 29, 2011, Lewis played the annual Summer Camp Music Festival in Chillicothe, Illinois, along with Chicago-based progressive jam band Umphrey's Mcgee. They were billed as Huey Lewis and The Rumors. Together they played covers as well as songs from both their respective catalogs. On April 2, 2013, Lewis appeared on the ABC television series Dancing with the Stars, where he performed "The Heart of Rock & Roll" in celebration of the 30th anniversary release of Sports and a concert tour with the News. After Lewis' cameo appearance as a teacher in Back to the Future, more substantial roles followed, including Vern Miller in Robert Altman's ensemble feature, Short Cuts, and Ricky Dean in Duets. He has performed in occasional television roles as well, including One Tree Hill, The King of Queens and a recurring character on Hot in Cleveland. Lewis provides the voice of Bulworth the junkyard dog in the animated series Puppy Dog Pals. On October 21, 2015, on an episode of Jimmy Kimmel Live, Huey Lewis reprised his role from Back to the Future in a segment where Marty McFly and Doc Brown arrive in the time machine and talk to the host. In 1985, Lewis sued Ray Parker Jr. over similarities between Parker's theme for the 1984 movie Ghostbusters and Lewis' "I Want a New Drug". The case was settled out of court with both parties agreeing to keep the settlement secret. In 2001, Parker sued Lewis, alleging that in a Behind the Music episode, Lewis had discussed the settlement in violation of their nondisclosure agreement. Lewis lives on a ranch near Stevensville, Montana. He considers it his permanent residence. He married his manager's secretary, Sidney Conroy, in 1983 in Hawaii. They separated six years later. They have a daughter, Kelly, and a son, Austin. In April 2018, Lewis revealed that he was suffering from hearing loss as a result of Ménière's disease, and canceled all upcoming tour dates. 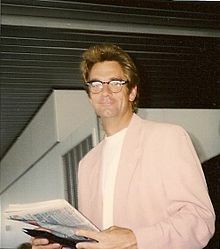 See Huey Lewis and the News discography for albums and singles by the band. Below are specific contributions by Huey Lewis as a solo artist. 1986: Montana Cafe Hank Williams, Jr.; duet on "You Can't Judge a Book (By Looking at the Cover)"
1993: A Tribute to the Music of Bob Wills & the Texas Playboys Asleep at the Wheel; vocals on "Ida Red" and "Hubbin' It"
1995: Come Together: America Salutes the Beatles; performer on "Oh! Darling"
1997: Marching to Mars Sammy Hagar; harmonica on "Little White Lie"
2005: Wrapped Around Chicago: New Years at the Riv Umphrey's McGee; guest performer on "Bad Is Bad"
2006: Safety in Numbers Umphrey's McGee; vocals and harmonica on "Women Wine and Song" ; harmonica on "End of the Road"
2007: Gospel Duets with Treasured Friends Brenda Lee; performer on "Oh Happy Day"
2009: Great American Soulbook Tower of Power; performer on "634-5789"
2016: Frankie Miller's Double Take; duet with Frankie Miller on "Way Past Midnight"
2016: S.O.S. 2: Save Our Soul: Soul on a Mission Marc Broussard; guest performer on "These Arms Of Mine"
2018: King of the Road: A Tribute to Roger Miller Asleep at the Wheel; vocals on "Chug-a-Lug"
2002 Just Shoot Me! Gary Rosenberg Episode: "The Boys in the Band"
2006 The King of Queens Himself Episode: "Hartford Wailer"
2011 The Cleveland Show Guy who looks like Huey Lewis Episode: "Die Semi-Hard"
^ a b All Music Guide to Rock: The Definitive Guide to Rock, Pop, and Soul (3rd ed.). Backbeat Books. 2002. p. 651. ^ "Lewis and the News are Rockers on a Roll". Philadelphia Inquirer. August 12, 1984. Retrieved November 21, 2014. ^ Erlewine, Stephen Thomas. "Biography: Huey Lewis". Allmusic. Retrieved September 6, 2011. ^ Hjortsberg, William (2013). Jubilee Hitchhiker: The Life and Times of Richard Brautigan. Counterpoint. ISBN 978-1619021051. Retrieved August 1, 2014. ^ Marin Nostalgia Retrieved 2016-12-16. ^ a b c d e Kramer, Jill (November 7, 2001). "Huey Lewis". JillKramer.net. Archived from the original on February 3, 2015. Retrieved February 3, 2015. ^ Kaliss, Jeff (June 24, 2005). "Huey Lewis still spreads the news". San Francisco Chronicle. ^ a b c d Trow, Paul. "Time for The News". Kingdom Magazine by Arnold Palmer. ^ "Gary Snyder, Peter Coyote, Joanne Kyger and Huey Lewis: Celebrating Lew Welch". October 24, 2012. ^ "Deep Cut". Missoula Independent. June 17, 2009. Retrieved August 9, 2011. ^ "The Billboard Hot 100 12/03/83". December 3, 1983. Retrieved October 10, 2016. ^ "The Billboard Hot 100 03/24/84". March 24, 1984. Retrieved October 10, 2016. ^ "The Billboard Hot 100 06/16/84". June 16, 1984. Retrieved October 10, 2016. ^ "The Billboard Hot 100 09/15/84". September 15, 1984. Retrieved October 10, 2016. ^ "Stuck in the '80s". Tampa Bay Times. February 2007. Archived from the original on August 20, 2010. Retrieved August 1, 2014. ^ "Huey Lewis and The Rumors at Summer Camp". Jambands.com. May 30, 2011. Retrieved April 14, 2012. ^ "Ray Parker Jr. Suing Huey Lewis Over "Ghostbusters" Comment". MTV. March 23, 2001. Retrieved August 1, 2014. ^ "Huey Lewis Baits Ducks, Ends Hunting Near Property". Billings Gazette. Associated Press. November 25, 2009. Retrieved August 9, 2011. ^ Myers, Marc (May 9, 2013). "Huey Lewis at Home on the Ranch". The Wall Street Journal. ^ Runtagh, Jordan (April 13, 2018). "Huey Lewis Cancels All Shows After Revealing Serious Hearing Loss Makes It 'Impossible' to Sing". People. Retrieved April 13, 2018. ^ "Adult Contemporary : Dec 23, 2000 | Billboard Chart Archive". Billboard.com. December 23, 2000. Retrieved August 1, 2014. ^ "Pocket Full of Soul – The Harmonica Documentary". Pocketfullofsoulmovie.com. Archived from the original on January 31, 2015. Retrieved November 3, 2014.